Jordan Barse is an artist and curator residing in New York. Her work is reflective of anxieties caused by ongoing threats of environmental disaster and our means of preparing for them. You can catch her work in Pet Names for Wastelands at Small Editions in Red Hook, Brooklyn, on view until April 10th. I'm working on a series of soft sculptures and tapestries derived from maps and window treatments and I'm making assemblages with preserved scraps of refuse mostly from my studio floor that I've been compiling for months. I am also in the process of curating a group show called Angel in the Haystack. What materials do you you use? I use fabric from all over the place and chains, beads, hardware, etc. that I've been collecting forever. Lately I've had a lot of luck finding cheap costume chain jewelry lots at estate sales. I use marbles I borrowed from my brother's collection for the insides of some pieces and old magazine images for gel transfers. My dust bunny assemblage pieces are made up of thread, stuffing, plastic trash, sequins, whatever ends up on my floor getting kicked around in the dust while I work. My work projects anxieties I feel about the inevitable disruption of environmental disasters and how we choose to acknowledge and prepare for what we cannot control (because it's more pleasurable to exist/invest in the here and now). I try to determine what it looks like to live myopically in the anthropocene and at the same time I experiment with futile gestures of anticipatory safeguarding. Having lived on the East coast my entire life, my principal fear is shifting convergence between water and land–flooding has the power to not only destroy but to mix and confuse. Still, the themes I work with exist more in a distracted, dream-like purgatory than in a state of dread or reality. What are mermaid purses? Can you explain your rendition of them? Mermaid's purses are another name for the cases that surround fertilized eggs of sharks, skates and other elasmobranchs. Often you'll find them dried up on the shore, black, hard and hollow, because once hatched the empty case is carried in by the tide. I'm really interested in the egg cases in gestation, however. They're translucent and usually have tendrils or adhesive fibers that allow them to anchor to the sea floor. To me they represent this kindof Jungian cycle of potential threat and exposure when human interference comes into play. I've recreated them with nylon stockings or mesh with things like marbles for embryos and brought them into my work as though they've been carried in by the tide through a living room window. They are little monuments to stale potential. I love your curatorial projects. What was the last show you put together? Thanks! The last show I put together was part of my new project called Theta. It was called Conscience Point, and it took place on 3 docks on Mecox Bay in Water Mill, NY. Conscience Point is the name of a national wildlife refuge located a mile away and it was also the name of a now-closed nightclub in Southampton where publicist-to-the-stars Lizzie Grubman drunkenly plowed her Mercedes S.U.V. into 16 people behind velvet ropes. It was a really cool show that was planned super last minute, but all the work interacted nicely with the environment. Marc Matchak's piece was three drawings of the main characters of Hitchcock's The Birds each adhered to pieces of bread, to be fed to the seagulls. Kathryn Knowlton made this amazing foam float containing a vacuum-sealed soap that she had made with sheep's fat, dregs of sea-worn fabric found on a magic beach, and the ashes of all of her childhood journals and religious texts. 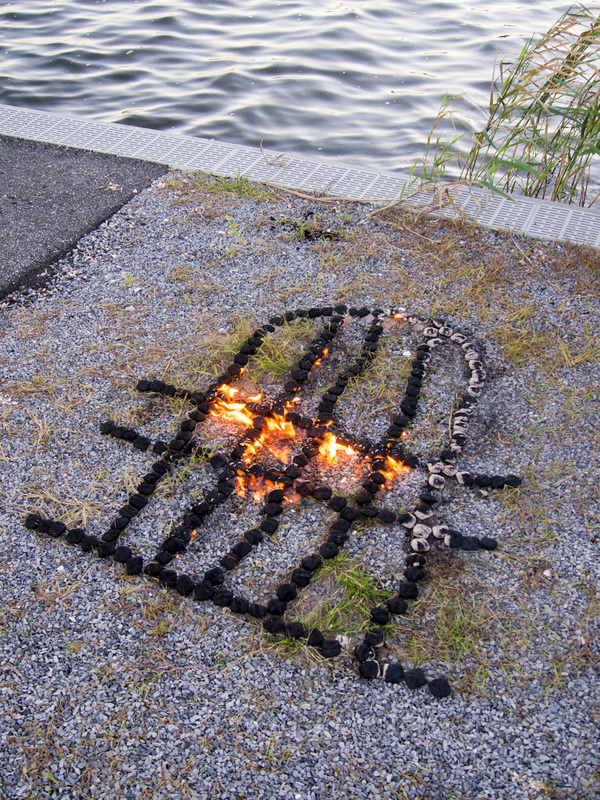 Doris Guo's piece was made up of twine and burning coals and was technically illegal to install on the lot where it had to be done, so I lit it up at 6am to not get caught.